A native of Eugene, Oregon, Bonham began singing at age five, playing the violin at nine and piano at age 14. After earning a violin scholarship at University of Southern California, she transferred to Berklee College of Music to study voice and began writing and recording her own material. On her 1996 debut The Burdens of Being Upright, Bonham established herself as a brash rocker with ironic nods to the emerging music of punk grrrrl bands. With blunt, direct observations on love and loss, the album went gold and earned the singer Grammy nominations for Best Alternative Music Performance and Best Female Vocalist. Critics took notice as well. Rolling Stone noted "this classically trained Boston singer-songwriter sets meandering Aimee Mann-like melodies over bright electro-pop folk with string-laden atmospherics." "Mother Mother", her first single, became a nationwide anthem and earned the singer an MTV Video Music Awards nomination. From the late 1990s to the mid 2000s, Bonham steadily recorded and performed both individually and with numerous groups, appearing with everyone from Blue Man Group and Aerosmith and to Ron Sexsmith and Juliana Hatfield. Following 2005's Blink the Brightest and the 2006 EP In the City + In the Woods, the singer took some time to focus on other things, earning a yoga teaching certification while learning to live a more balanced life, not realizing initially that her non-musical experiences would be fodder for what would eventually become Masts of Manhatta. "Making music is what I will always do," says Bonham. "I realized I didn't have to divide it into 'career' and 'not career'. I make music. I needed the music business machine for a minute. Now I realize I don't. Every record before this, I had some expectation for how the record should do commercially. But now, it's a wide open slate and I'm okay with that, as long as I can create new opportunities and grow from them. Life is so good right now; how could I go wrong?" 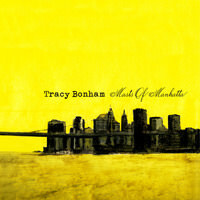 Enter your email address for Tracy Bonham related news & updates.